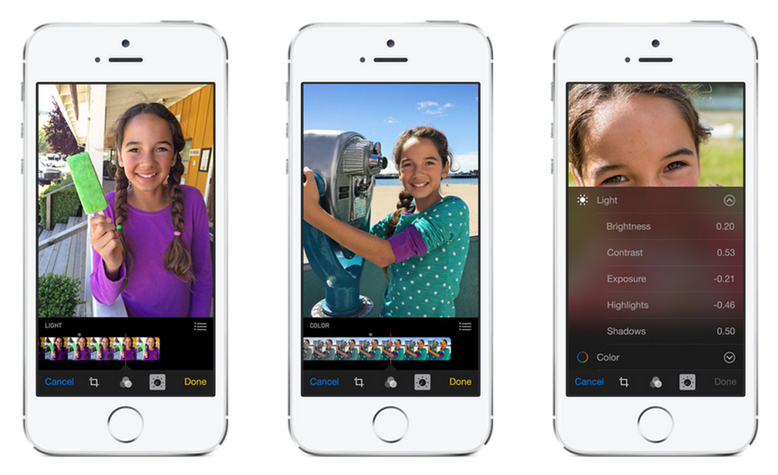 Apple is working to open up camera controls in iOS 8, giving photographers granular control over settings such as ISO, shutter speed, and more, reports AnandTech. While only a few manual controls will make it into the stock camera app, almost full manual control will be made available for third-party app developers to implement as of iOS 8. According to AnandTech, iOS 8's AVCaptureDevice APIs will let developers tap into advanced controls such as ISO, shutter speed, focus, white balance, exposure bias, EV bracketing, and shutter speed/ISO bracketing. The ability to manipulate these controls will provide photographers with new ways to creatively compose a shot or a video clip. Developers also can use these controls to offer a variety of camera presets and other behind-the-scenes algorithms that manipulate images during the capture process. While only the exposure bias controls will make it into the stock camera application, all of these new controls exposed through the AVCaptureDevice APIs will enable camera applications similar to Nokia's Pro Camera or HTC's Sense 6 camera application. It's been said that Apple is one of the few OEMs that take camera seriously, and these new controls can only cement that position. Apple has steadily boosted camera performance in its iPhone models by improving both the hardware and software that powers this feature. As a result, the iPhone is known for its exceptional camera performance and has been among the most popular cameras on Yahoo's image hosting service Flickr. The next-generation iPhone 6 is expected to continue this trend with iOS 8 camera improvements such as time-lapse mode as well as new iPhone camera hardware that may include optical or electronic image stabilization, a wider aperture, as well as an ARTON filter to minimize CMOS color shifts. Please give us a raw files mode. Nokia promised it, and then never delivered. It'd be such a nice option. Why not create a full manual setting within the Camera App? Why just leave this ability for third party Apps? I would simply like for iOS to stop scaling the image down by half when you add a filter effect, then save, using the native photo editor!!!!!! iOS lost its simplicity, too many settings, more open for developers than ever before. Would a phone produce useable RAWs though? I mean of course they'd be uncompressed, unsharpened and un-noise reduced, which is already better than JPEG, but would the dynamic range be any better? I doubt the iPhone's sensor has a dynamic range greater than what we're already seeing in the JPEGs. It would of course be good to have RAW but maybe we're over estimating the benefit, this is not a DSLR. From a camera that can generate RAWs, IMHO RAW files aren't temporary. They should be treated as your originals. The analogy to the film days is a negative. Just like in film (you want to keep your negatives), in digital you definitely want to keep your RAWs. You never know. JPGs/Other compressions are used to share with. Those can *always* be generated on the fly. The whole point to a RAW is uncompressed files for editing.